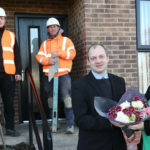 Sheffield Housing Company (SHC) is celebrating the completion of the 600th home, the creation of 500 new jobs — 62% of which have been filled by people from the city region — and the awarding of 60 apprenticeships. In achieving these milestones, the company has spent over £80m with construction sector businesses in the city region. Office worker Katie Woodhead and her bus driver husband Paul bought the 600th house to be completed on the Eclipse development on Harborough Avenue, Manor Park. Katie said: “We had been renting for a while and wanted to buy a home of our own. The 60th apprentice is Cameron Akers, from Darnall, who is now training in horticulture with Northern Groundcare, carrying out landscaping on SHC developments. Cameron said: “I did my A levels at college but didn’t really want to go to university. SHC is currently working on the second phase of a 25-year plan to build 2,300 new affordable homes. Pictured above are: Cameron (left), Gregory (second left) and Cllr Scott welcoming Katie to her new Sheffield home.